New Sweaters In PurringPyjamas Shop + Aether’s Debut As A Model! Hello! How are you doing? Maybe you’re having a break from this heatwave? ‘Cause we sure have! It’s still warm, but we’re not melting at least! And while winter isn’t on your mind right now (or maybe it is? I can’t wait for cooler weather! ), let’s talk about it as it will come in no time. Today I want to talk about the new additions to PurringPyjamas shop! Being cute and very purrfessional! The first sweater is blue and white, which can stand for many things. Over here in Finland it would stand for the saying about Finland being a country of snow and a thousand lakes (believe me, we have waaaaay more than a thousand of them, haha), to someone it may associate with white sandy beaches and sea, and to someone else it may remind about the dark blue skies and some white clouds – I am sure I am not the only one who used to try to find different shaped clouds that would remind of some animal or something. Whatever you associate these colors with, they are always fun to add to anyone’s collection! Curious about what’s going on. Now the next sweater is something that will always be a load of fun! These stripes look sunny, bright and will keep your little Sphynx feeling like it’s forever spring! I love spring, and what about you? I think it’s amazing to finally get more sun and see the nature being reborn and blossoming. What a wonderful thing to see! And yes, we always have to have something pink! This pastel color striped sweater will fit many people’s tastes. It’s minimalistic with only 3 little beads attached to the neck, so this sweater isn’t for the flashy ones! Where did all the toys go? Oh, that’s where the toys are! Now this pink is the complete opposite of the pastel striped sweater – it’s in neon coral pink color! The sweater is very bright (as I’m sure you can see from the pictures) and not suitable for the faint hearted! 😊 It also has a nice modern mixed with a classic touch to it – a beautiful decoration made from classy pearl and silver tubes. Who said boys can’t wear pink? Aether looks fabulous rocking his pink sweater! Is that catnip that I smell? And now… Welcome to the bow kingdom! These sweaters are not only cute, but they’re also warm! They’re perfect if you want to add some bling to your daily life – the teal color sweater has blue shiny thread running through it, while the pinky beige has a holographic one. Whichever one you choose, you can be sure about your kitty shinning bright like a diamond! Looking cute dressed in purple. Continuing with the shiny theme, here’s another sweater. It’s beautiful metallic purple, which you don’t see everyday. The sweater is super soft, very light and stretchy, but still very warm. The yarn itself cost me a small fortune, but I liked it so much that I decided to ignore a pretty big price tag. And I am surely happy I did! And last, but not least is this super fluffy, bluish gray sweater. It’s pretty hard to describe it’s color – in some light it looks bluish gray, while in other situations it seems to be more of a grayish blue. However you look at it, the sweater is still just as beautiful! It’s very warm, thick and has a nice softness to it making it a really good option for cold weather. It also has some multicolored beads attached that make the sweater even cuter. I hope you enjoyed this short blog post and a few of the new designs that had been just added to my shop! Have a great week ahead of you, and talk to you soon! Hi, everyone! It’s been couple of weeks, and it’s time for a new blog post! This one was planned already a week ago – I knew I will be writing about the new sweaters I will be adding to the shop (yep, it’s that time of the year already!). And I am writing about the sweaters I originally planned, just that they turned out to be… a fail. Yes, you heard me right – I am writing about the sweaters that failed, which also proves that not everything that looks good is actually practical. So I got these super cute faux fur pompoms couple of months ago. They definitely were bigger than I thought when originally purchasing them, but I was like “Well, you know – go big, or go home! Bigger ones will look even cuter on the hoodies!”. And they DO look cute! However, they are very impractical simply because they’re too big, which results in them being too heavy. What I mean by saying “too heavy” is that they would fall on the side of the cat’s neck, which means that the hood is in an uncomfortable position. It also would annoy the cat if they want to eat/drink. For this reason these sweaters definitely won’t be something I will be adding to my shop! Because even though they look cute, I wouldn’t be selling something I think is uncomfortable. Not bothered by the hoodie falling in weird positions. Everything is always tried out by my cats beforehand, and if I see that something annoys them, then it means it will most likely annoy other cats as well. I will definitely be making some kind of sweaters (maybe will stick with hoodies, just no pompoms?) from these green and pink yarns, cause they’re beautiful! Typical Beliza – curious, but too lazy to do anything. Hello, pompom, my old friend. I hope you enjoyed some pictures of my cats and failed sweaters, haha! Talk to you very soon! The softest sweaters in the world are here! Well hello there! The last time I posted here almost a year ago… How crazy is that?! Life happened I suppose. Sometimes we just get so invested in our works, and routines that we (unfortunately) forget about the things we enjoy. And blogging is one of them for me! But enough of rambling – that’s not what you came here for! Let’s dive into this new super soft fuzzy blog post and many adorable pictures of my hairless monkey cats are to follow! 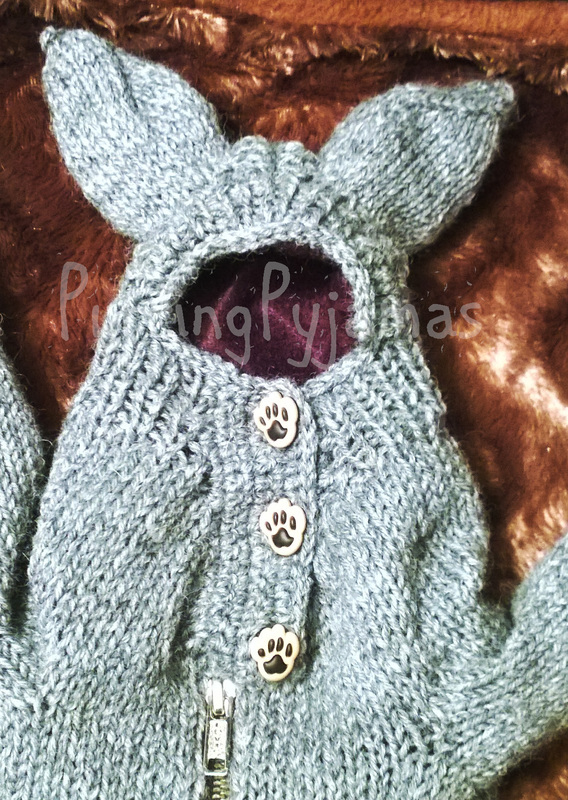 I am pretty sure that if you checked out my shop, or Facebook, or Instagram at some point this spring, you’ve probably seen these fuzzy sweaters already. You may ask – well why you keep on posting about them, what’s so special about it? Well, firstly, now this style sweaters are available in 9 (yes, NINE!!!) different colors. How awesome is that?! But colors is not the only (or most important) thing I want to emphasize here. I just… I just can’t get enough of these super awesome sweaters, and neither can my cats! They feel so cozy wearing them when it’s chilly outside. And you know what else is awesome? These sweaters are made from yarn meant for babies. They’re literally the softest thing you will ever touch in your life (besides your Sphynx, if (s)he happens to have a peach fuzz). They’re VERY soft, VERY warm, VERY cute, VERY stretchy, and the best of all – ANY and EVERY cat will love one of these sweaters. They are definitely the most comfortable and soft sweaters I’ve ever made, and believe me – that’s a huge statement considering I made almost 300 (288 to be precise) different designs since 2015. I just love these sweaters so much! I think you can see in the pictures as well that my cats are feeling really comfy. Beliza was constantly half asleep, because they’re so warm and cozy! #photoshootproblems, haha! All of these sweaters are available in few sizes, and soon I will restock them in even more colors and sizes. Why? Because they’re that awesome! 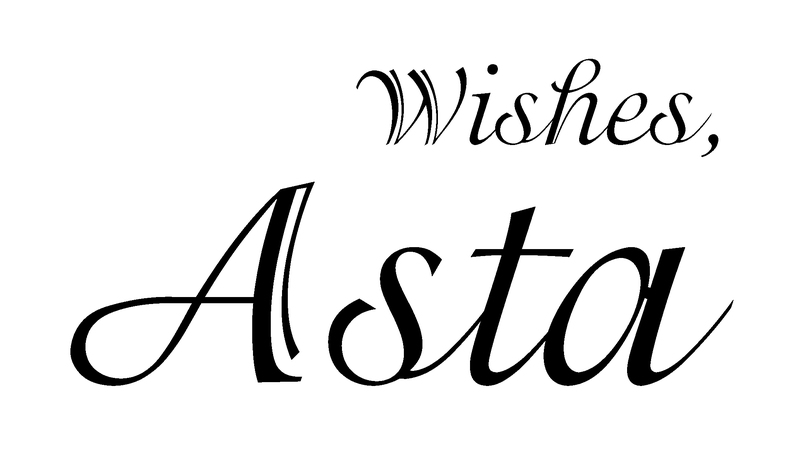 I hope you enjoyed this little blog post, and I wish you all a fabulous day! Bling The World: New Super Soft Swarovski Sweaters Are Out! Hello! I hope you’ve been doing well and the spring has been showering you all in nice and warm sun! Today I come here with a new post about the very new release in PurringPyjamas shop – it’s super soft, cute, very high quality and it blings… Yes, it sounds like a dream, right? Well, because it is a real dream for your precious kitty! “But why you chose to make the sweaters so… simple?” – you might ask. Fair question! I think that beauty often is in simplicity. I see so many beautifully made sweaters out there, with all these intricate ornaments and patterns, and sometimes it’s just a little bit too much. I think it’s important to be creative and try out new things, but we also should remember the very roots where we came from. Yes, it is a very basic pattern, but hey – the gorgeousness of the yarn and the little tiny bling of some Swarovski crystals make these sweaters so beautiful! Again, you may ask another question – but why these Swarovski crystals are almost the same color as the sweaters? Why didn’t you put dark blue crystals on a white sweater or light pink crystals – on gray? Well, there is an answer to this question too – I wanted this collection to be subtle. For this reason, all the sweaters have bling, but it doesn’t shout from the distance. It is meant to give a little something special to this beautiful yarn, but not to overpower it. Over time, I released many different sweaters – some with very bright colors and complicated patterns, while others were subtle and minimal. These sweaters are an ode to simplicity. If you’re interested in checking out this collection, you can find it here: High Quality Sweaters. I hope you all are having a fabulous Monday! 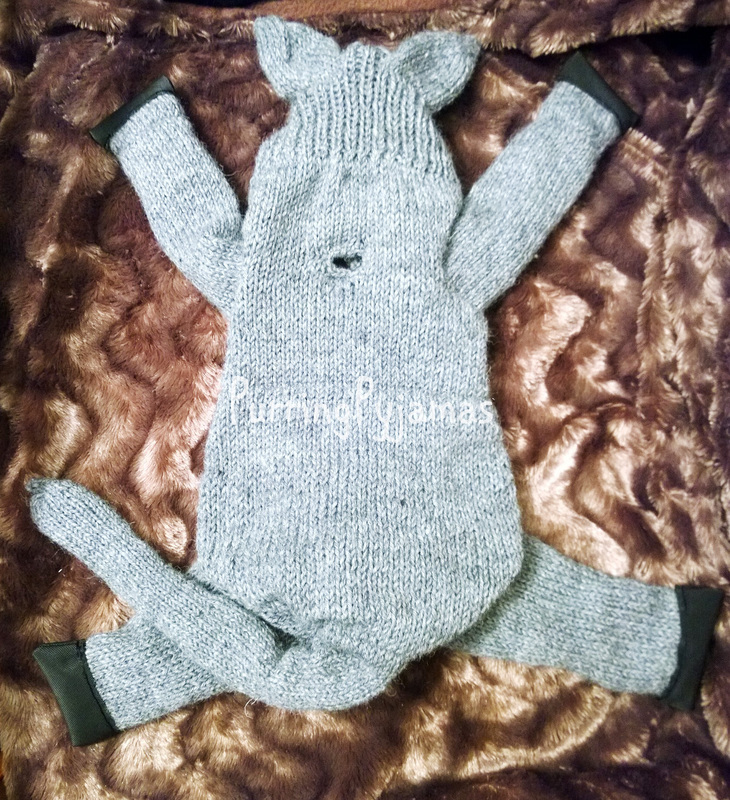 About a month ago I was contacted by a person, who wanted something rather unusual: a snowsuit for her Sphynx cat. She said that her cat needs daily walks, and towards the winter the weather gets cold where she lives, so she needs something that would protect her naked kitty from getting cold and sick. She mentioned that she contacted some shops that sell cat clothes before, but none of them agreed to do this kind of project. And now I understand why: it takes a lot of thinking, a lot of time and quite a bit of work. 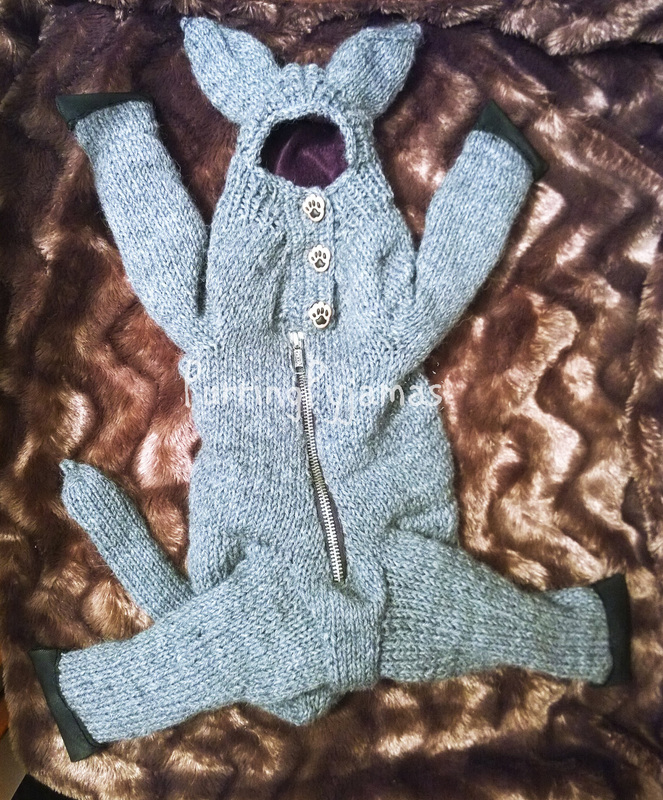 I can’t say it was very difficult to figure out the structure of the snowsuit, because I have my own cats, that are live example of what my clients look like 🙂 The knitted part was pretty easy and quick. But the real thing started with the sewing. I spent 12 hours straight sewing it. Yep, maybe that looks silly, because it’s not a HUGE project, but it is quite time consuming, when you hand sew every single detail. 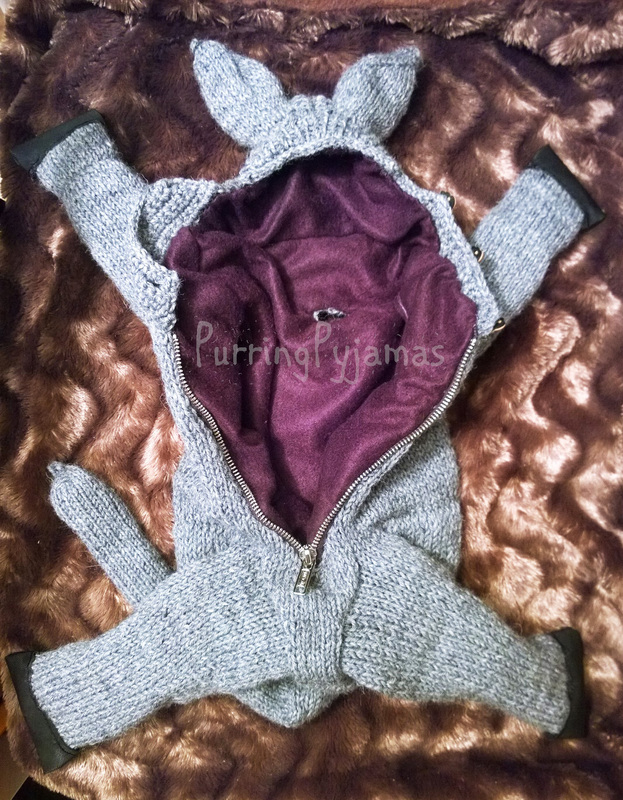 The snowsuit’s outer layer is hand knitted and the inner layer is fleece. It is very warm and thick, so the wind and cold won’t reach the kitty. The paws are also waterproof – I sewed the glove-like fabric, which will prevent the paws from getting wet. Oh, and in case you were wondering why there’s a hole in the snowsuit, it’s for the harness. I sent the pictures to the customer and so far she is satisfied with everything, which is great. The only concern that I have is the fit. Even though I had all the needed measurements, it’s always a gamble with something like this. If it was only the knitted part, I wouldn’t worry even a bit, because it’s so stretchy and comfy, so even if something’s a little tight somewhere, it will stretch out. But it’s the fleece I am worried about. It’s stretchiness is quite limited, so if something doesn’t fit, it might be difficult to make it bigger. But fingers crossed it will fit! Would I take on another project like that? Probably yes! Even though I felt quite miserable after those 12 hours of sewing and all my muscles were sore, if the sweater will fit the kitty it will be the biggest reward! I think it is important to do something you’ve never done before, because it gives you not only skills, but is also daring and interesting.